Specmaster, Ingeniq, med6753, morris6, neo and 35 Guests are viewing this topic. Yep, might as well get comfortable. You'll be here a while. At work we really quieted down the Prusa i3 Mk2 by simply putting a very soft styrofoam board under it. I just bought a broken Agilent DSO-X 3034A including original probes. How will I be able to justify this to my swmbo..? I do hope it's repairable since it was described as having a firmware failure and no issues with the front end. If I'll have been able to manage that I could argue how much money I saved but if I don't..
That's a biggie! Bet that hurt the wallet a bit even when it was dead. TBH that's probably worth shipping back to keysight to be fixed. *Snerk* The amount of coke those boys did, that thing probably shriveled up to the size of a raisin. Major part of why Glenn was such an asshat at the time, though. Awesome apocalyptic artwork by Canadian cartoonist Max Dunbar. I have managed to create a part in Sketchup that should be reasonably serviceable; while not as polished as I feel I managed with the base of the meter stand, I've decided to declare success and move forward. It's printing now. I take it that in this universe Lucy van Pelt is drawn like Tank Girl (The comic book version, not the sanitized film version). That's awesome! I doubt it's possible either, but hey... this is the internet. Folks here never cease to amaze me that way. As is the case with TEA, what is most important is not usually A or B, but what goes on in between. My Tornado came with proper screwed-on rubber cup feet, but I still stuck some self-adhesive 8mm thick foam rubber pads underneath them to eliminate the sounding board effect of my drafting table. It quieted things noticeably, without creating any detectable wiggle in the base. Not a big fan of those dampers; they allow belts to cog if something binds rather than tripping the current limit in the stepper driver. This leads to teeth ripped off the belt. The better solution is to cure the noise at the source: The PWM noise created by the stepper drivers. The TMC2208 stepper drivers are the fix for that; they do it by knocking the corners off the step pulses to make them a little more sinusoidal, and by upping the frequency a little which GREATLY reduces the audible harmonics. They cost about $30 for a full set, though you really only need the X & Y to get rid of most of the PWM noise. I was about to ask if you'd gotten it with all the MSO options enabled... guess you'll know once you get it and see if you can recover from the chip. But you're not thinking about that stupid RC-what-the-fukkever now, are you?!? Yeah, I originally added it that way, but then thought it might set the two parts too far apart, the spacial disconnect having more potential to cause confusion within such a long post. I've changed it back to give it another try. The better solution is to cure the noise at the source: The PWM noise created by the stepper drivers. The TMC2208 stepper drivers are the fix for that; they do it by knocking the corners off the step pulses to make them a little more sinusoidal, and by upping the frequency a little which GREATLY reduces the audible harmonics. They cost about $30 for a full set, though you really only need the X & Y to get rid of most of the PWM noise. It's all about the balancing act. The current limiter is supposed to shut the motor down if there's a STALL; it has to be set high enough that you don't have missed steps like happened with my first print. This is still a pretty fair amount of torque applied to just a few teeth on a T6 belt. Those rubber isolators A) reduce the precision of the drive by being flexible and creating natural pivot points across the axes of the bolt pairs and B) allow the pinion to deflect instead of stopping, thereby allowing the belt to cog and rip teeth off. They're being sold here as a gimmick; they're not intended for this use. 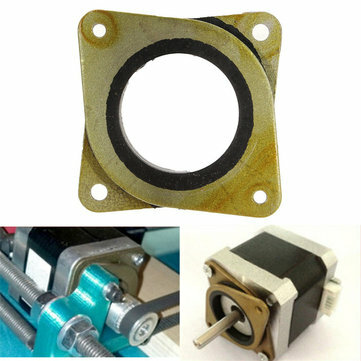 They're intended to be used as a self-alignment mechanism for stepper motors with integral leadscrew. He got the football - what happened to Lucy? She's probably busy with an institution full of PTSD patients in that post-apocalyptic future. Yeah, I originally added it that way, but then thought it might set the two parts too far apart, the spacial disconnect having more potential to cause confusion within such a long post. I've changed it back to give it another try. I understand, and I appreciate. Thanks! Post-apocalyptic future... guess he couldn't save her. Or maybe he actually managed to kick it sometime in the limbo after Schulz' last strip, ending the game. At least yours got to you. Tonight, I get a text my DE-5000 has FINALLY been delivered... 8 minutes after the supposed delivery time, I find this. Ummm.... yeah. I wish I could say this was the first time... but it isn't. There is a pretty good chance that this delivery notification is an outright fabrication as well, and I may get the package tomorrow. It has happened to me before. Now that I've given up all hope, I'm much better. I used to be constantly disgusted; now I'm merely amused. Who says they are lying? It says it was delivered ... just not exactly where. It's a black metal box, outside in the Texas sun. It is by definition VERY solar. Actually, it specifically states it was delivered in my mailbox. My VERY EMPTY mailbox. Conveniently well after business hours for the Customer Service line, which typically takes 30-60 minutes to get through to an actual person. I can literally drive to my post office in person and rattle the postmaster's cage in person faster than I can get anyone on the phone. And as I just said; this isn't the first time. I've had items supposedly delivered like this, then called Customer Service the following day, who contacted the carrier and came back to me saying that said carrier had my package on their truck for delivery THAT day. TWICE. In short, the delivery notification was UTTER fabrication to make it look like they're doing their job. If it was misdelivered, there's pretty much ZERO chance I'll get it; I've had THAT happen here too. Hope whomever got my box of flight controllers and brushless motors has a great time with them. "Oh, we're sorry; your route was handled by a temp yesterday. They must have put it in the wrong box." "Okay... how do I file a claim?" "Does your package have insurance?" How would I know? I never RECEIVED it!" "Well if it doesn't have..."
"You have the tracking number right in front of you. Look it up." "I'm sorry sir, you'll have to have a trace done on the package..."
"A what?!? You KNOW it was mis-delivered; you just told me so. It doesn't MATTER if I have insurance. The Post Office has been grossly negligent here." I keep mine next to the Widlarizer. I had to stop doing that; I reached for the ol' thumb-detecting nut-fucker one time without looking and started mahhering away at a stuck optical drive... by the time I realized the hard "WhaM! WhaM! WhaM!" I expected was actually a dull "whudd! whudd! whudd! ", I'd wasted half a magazine of crowbars somewhere in the Ukraine. Do you have any idea how expensive it is to reload that damn thing? Ah, yes. The solar toaster oven.